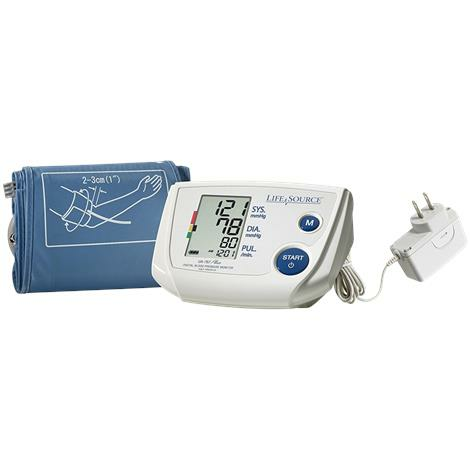 A&D Medical One Step Plus Memory Automatic Blood Pressure Monitor is fully automatic and inflates to the correct pressure each time a measurement is taken. It stores the last 30 readings in memory and also displays average readings, automatically calculated of the total readings stored in memory. It also has unique irregular heartbeat feature that provides blood pressure and pulse rate measurements even when an irregular heartbeat occurs. 120V AC adapter (model TB:181A) or four type "AA" alkaline batteries (1.5 volt). Batteries not included. We do have AC adaptor for A&D Medical BP units. You can search for A&D Medical AC Power Adapter For A&D BP Units on our website.